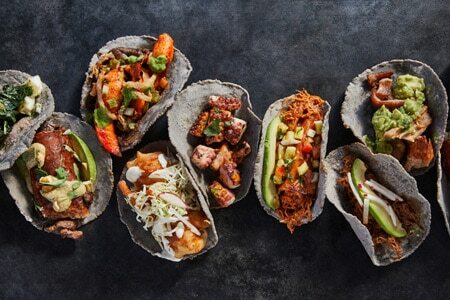 Tequilas and eclectic takes on taqueria-style tacos at this bustling Irvine venue. About the restaurant & décor: Situated in a highly visible corner of the perpetually lively Park Place business and retail center, this second Irvine offshoot of the San Diego-based upscale taqueria is in a prime location to attract the center’s lunch crowd as well as locals for dinner. The airy, colorful space welcomes the gathering throng with a sleek industrial-themed interior, an intimate outdoor patio and a massive rectangular bar buoyed by a rather nice list of tequilas and mezcals. Food & Drinks: Diners can start things off with the gooey queso fundido verde or the guacamole generously stuffed with Parmigiano Reggiano cheese. A wide selection of kicked-up tacos anchors the menu. While you can order a classic like carnitas or fish, we recommend trying unique iterations like soft-shell crab, zucchini and cactus, or shrimp with crispy melted cheese. An impressive assortment of Baja beers is on hand, ready to pair with whatever taco you choose. Desserts are highlighted by the tres leches cake.